Prototype: German Federal Railroad (DB) express train for the route Frankfurt (M) Airport - Stuttgart in a special German Lufthansa paint scheme. Class 103 electric locomotive with a type Avmz 106 compartment car and two type Bpmz 296 open seating cars. Both car types have airtight construction. The train looks as it did in the summer of 1991. Model: The class 103 electric locomotive has a digital decoder and extensive sound functions. It also has controlled high-efficiency propulsion. 3 axles powered. Traction tires. The locomotive has triple headlights and dual red marker lights that will work in conventional operation and that can be controlled digitally. The headlights at Locomotive End 2 and 1 can be turned off separately in digital operation. When the headlights at both ends are turned off, then the "Double 'A' Light" function is on at both ends. The engine room lighting can be controlled digitally. The cab lighting can also be controlled digitally. Maintenance-free warm white and red LEDs are used for the lighting. The compartment car and open seating cars have underbody details specific to the car types. The type Avmz 106 has Fiat type Y 0270 S trucks with shock absorbers to reduce "hunting". The type Bpmz cars have type MD trucks without generators. The cars have structural features of airtight cars such as SIG diaphragms, entry doors, and windows. All of the cars have factory-installed LED interior lighting. One car has built-in marker lights. Total length over the buffers approximately 107 cm / 42-1/8". Highlights: The class 103 includes over 16 functions for the first time. Cab lighting. Engine room lighting. Locomotive engineer. Partially new tooling for the types Avmz and Bpmz. Types Avmz and Bpmz in the airtight version. Passenger cars with SIG diaphragms. All of the cars include factory built-in LED interior lighting. One car includes marker lights. When the newly constructed line from Stuttgart to Mannheim went into operation on July 2, 1991, it was planned that the Airport Express Stuttgart – Frankfurt Airport would take this route. However, due to the higher speed and above all the pressure problems in the numerous tunnels on this new line, the existing cars and locomotives could no longer be used here. Along with a decrease in the running time to 90 minutes came an expansion to four daily pairs of trains that were to be run with only one locomotive. Admittedly, two train sets were required due to the short turnaround times in Stuttgart. Airtight cars repainted to Lufthansa specifications were assigned to the Airport Express with electric locomotive 103 101, also painted to match the train, from the Frankfurt/Main District. The class 103 changed to the Lufthansa colors to match the cars in the train. Light Gray (RAL 7035) now dominated on the locomotive body and the roof hood. A narrow edge of Melon Yellow (RAL 1028) gleamed on the lower edge of the locomotive body at the transition to the bridge frame. This color continued in the upper part of the bridge frame. The older design ventilation grills kept their customary silver gray color. The lower part of the bridge frame including the buffer cladding and trucks have by contrast a dark gray color (NCS 8000). On the sides in the yellow area of the frame the lettering, "Lufthansa Airport Express", stood out and the DB emblem was located in a greatly reduced form only on the sides to the left next to the road number. Compared to the rolling stock road number 103 101 was not airtight and the schedules were therefore designed so that trains could not meet in the tunnel sections. The short turnaround times in Stuttgart then led to a "flying change" between the two car sets, usually consisting of three cars, which played out as follows: One car set stood on a track in readiness in the Stuttgart stub end station. The Airport Express coming from Frankfurt arrived on this track, the locomotive uncoupled from that train and coupled again to the cars already standing there in readiness. A switch engine pulled the car set just arrived to the coach yard to be readied for the next run and after a few minutes, the Airport Express could depart again. Unfortunately Lufthansa halted all service at "Elevation Zero" on May 23, 1993 and road number 103 101 was thereby underway for the last time on the day before. Lufthansa Airport Express is a registered brand of German Lufthansa, Inc., Cologne, Germany. All rights reserved regarding reproduction. 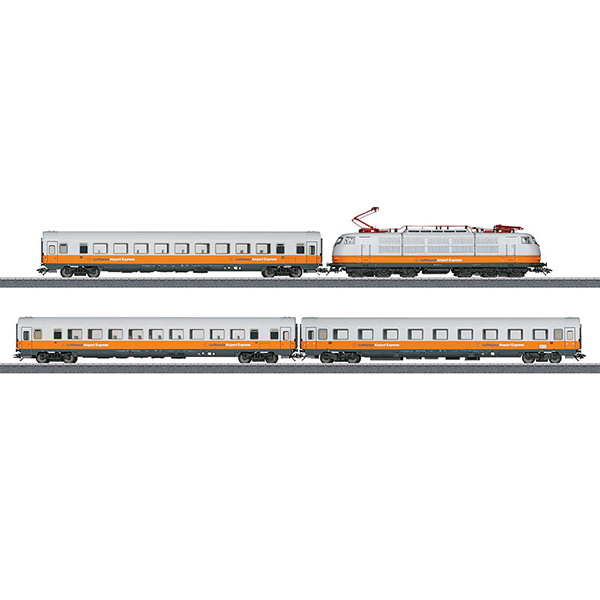 This model can be found in an AC version in the Marklin H0 assortment under item number 26680.